Lost in this recent "gourmet" sandwich craze are the what we call "original sandwich joints". No, I'm not talking about Subway, Skyway or The Sandwich Tree. Yes, those can be quite acceptable places to grab lunch; but Ben Stein has more character than them combined. 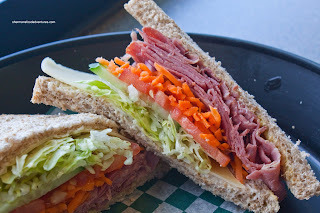 What I'm talking about are those mom 'n pop places that have been serving up solid sammies in homey and friendly lil' places long before "hip" sandwich shops hit the scene. Okay, there are too many to count and it'll take awhile to hit all of them; but we have to start somewhere. That somewhere may not be the most obvious either. 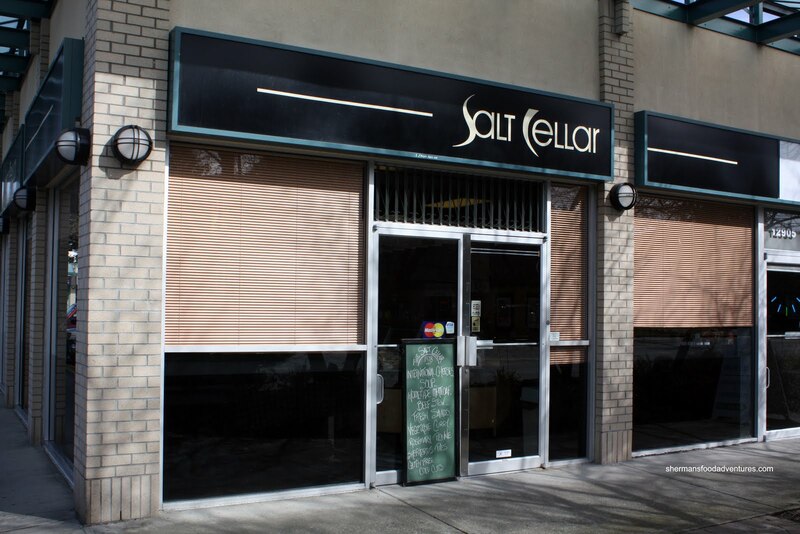 This place is the Salt Cellar in White Rock. It fits the homey, neighbourhood deli/sandwich joint to a T. Nothing fancy here. For those who are have issues with gluten, many of the items are available gluten-free. For lunch, I decided to go for the soup and sandwich. I went for the home-made Vegetable Soup to start. Now, for some people, a vegetable soup might elicit as much as excitement as a bingo game at a senior's centre. However, this vegetable soup was very good. Gimme a "B-9"! Sorry, I actually do like bingo, especially on cruise ships. 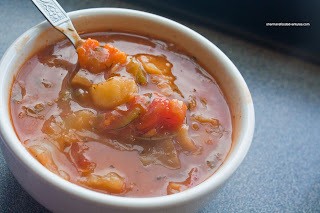 Anyways, there was a plethora of chunky veggies in a naturally flavourful broth. It was very evident that this soup was made with fresh ingredients and with care. For my sandwich, I selected the Smoked Meat on whole wheat. As you can see, it is not fancy. No artisan bread, the meat is not piled ridiculously high nor are there any fancy sauces. It is a regular sandwich with fresh ingredients. No, it didn't blow my mind; but it was satisfying nonetheless. Now faced with a deli full of products, you know I wasn't going to leave merely trying one sandwich and a bowl of soup! Therefore, I went crazy and got a few things to go. 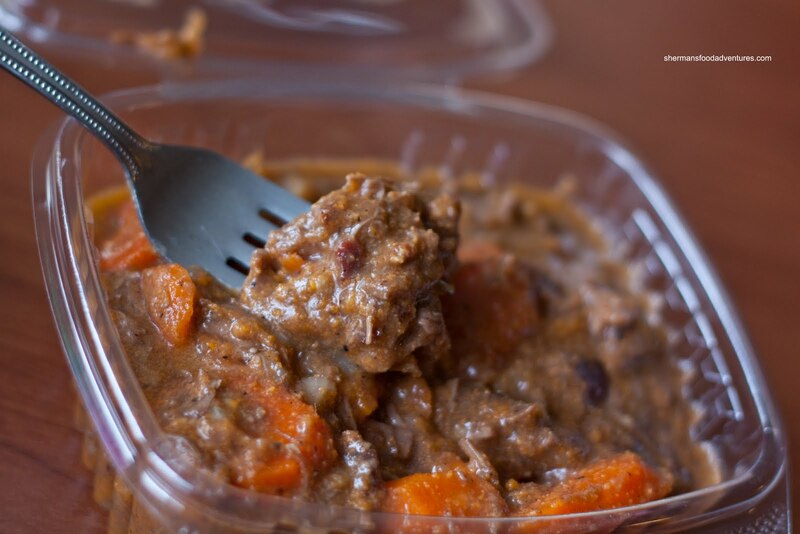 They have a wide selection of dinner ideas which are ready to be packed up or they can warm it up for you to eat in as well. I picked up a portion of their Beef Bourguignon which was very meaty. 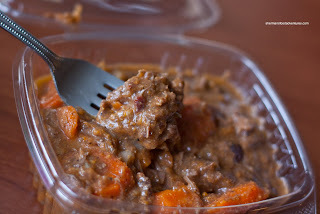 In fact, it was mostly meat with some carrots and onion. There was a rich red wine flavour combined with the beef juices. As a result the whole thing was flavouful and all-around tasty. 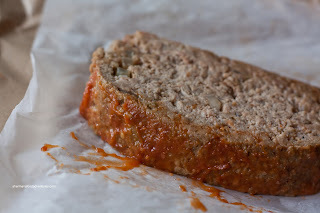 Not satisfied with only one savoury item to go, I also got a slice of their Meatloaf. I didn't actually get to try any of this since Viv had it for lunch one day. From what I remember, she said it had a pronounced onion flavour while the meat itself was slightly dry. At the very least it wasn't too fatty. Due to the way it is meant to be packed up and sold, there was not enough of the ketchup-based sauce to go around for the slice of meatloaf. As I was picking out the savoury stuff, the desserts caught my attention. Well, not really, I'm not much of a dessert guy; but I figured to get some for research purposes. 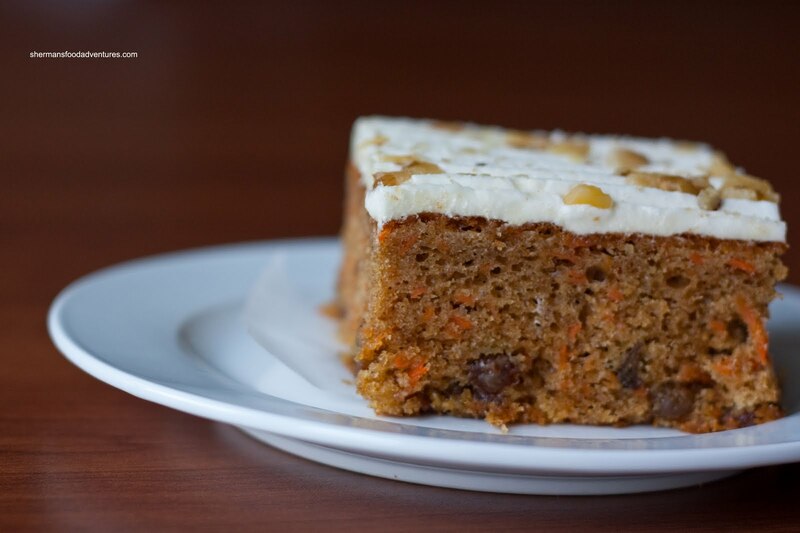 The first dessert was the Carrot Cake. It looked pretty good and in fact, it was good. I found the cake to be quite moist and nicely spiced. Lots of carrot and raisins hidden inside while the cream cheese frosting was modest, which meant that the cake was not too sweet either. Viv had the other half and basically echoed the same opinion. She is much more into cakes and really enjoyed it. 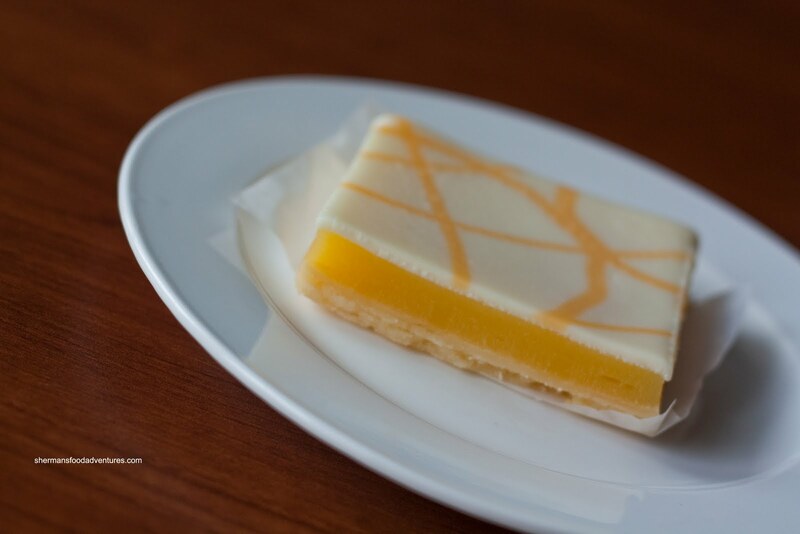 Now for my favourite item purchased at the Salt Cellar - the Lemon Square. Well, it is really a lemon bar; but it came as a square. It looked pretty and since I love lemon desserts, I had to get it. One bite and it was obvious there was a high-lemon content. It had a zing that hit me right away. There was just enough sugar to temper the tartness. Yet, other than the lemon, the most pronounced flavour was of butter. That, to me was slightly too much. Don't get me wrong, I love butter, especially on bread and in pound cake. I just don't like so much it begins to conflict with the other flavours. 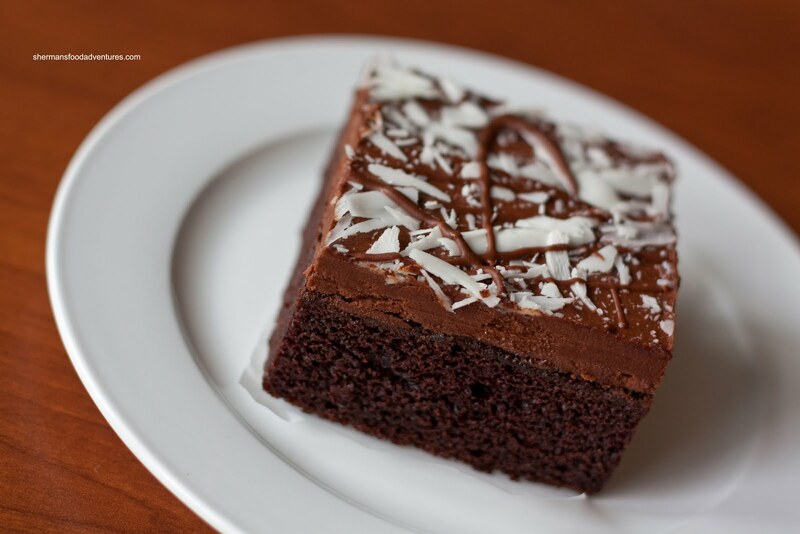 The last dessert item was a classic Chocolate Cake. We found the cake itself to be pleasing to look at it. We do eat with our eyes, so it is pretty important. The rich dark coloured cake was actually quite moist. I personally wasn't a huge fan of the chocolate icing; but then again, I'm not much of a sweets person. 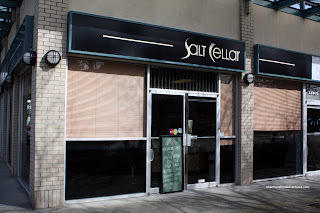 Whatever the case, the stuff here at the Salt Cellar is just plain solid. Sure, it doesn't have the glitz of modern touches of a Dirty Apron; yet it doesn't have to. Now I wouldn't suggest anyone actually make a special trip out to White Rock; but if you're in the area, go in and say hi. The warm welcome from the proprietors, reasonable prices and food that is made with care and quality ingredients are enough to keep the locals coming back.